If you're a regular visitor here, you know that I cook on a Big Green Egg. I've become quite enamored with the Kamado style cooker and it's neat to see that there are a growing number of companies that recognize the benefits of this design and have begun to introduce their own versions. Recently, I was contacted by the folks over at Bubba Keg. These are the folks who make travel mugs & coolers shaped like beer kegs. It seems they have introduced their variation on the Kamado theme. The basic design isn't much different from the big players in this space but it's constructed of double-walled steel with oven-grade insulation rather than ceramic. Hitch adapter for transporting the cooker via a standard receiver hitch. This is very cool and makes the cooker ideal for tailgating, camping, etc. A metal stand with large wheels. The small wheels on the BGE nest are problematic when moving the cooker. It's also lighter than the ceramic cookers, but I guess that makes sense given the construction. This thing even comes with a built in bottle opener! There are a few things that I'd like to know more about. There's no mention of a platesetter or an accessory to create the barrier between the cooking crate and the fire. This seems pretty common on the competitors. In fairness, I've never tried to smoke without the platesetter on the BGE but it makes sense to me to have a barrier between the food and the fire. I'd also like to get a better look at the detachable tables and the top damper. I can't tell from their website or video what those parts are constructed of. Bubba Keg is making an effort to introduce this style of cooker to a more mainstream audience by partnering with Hope Depot for distribution and in my mind that's a good thing. It had been awhile since I'd done ribs on my Big Green Egg, but with the weather hovering around ~70 degrees I decided Saturday was a perfect day to fire up the cooker. So off to the store I went for some ribs. When I got there, all that was available were spare ribs. Now I usualy cook baby backs but didn't feel like hunting all over town for them so I just went with St Louis style spare ribs. What's the differnece? Well, baby backs come from "high on the hog" and are typically smaller and more tender. Spareribs on the other hand come from the belly of the hog, are larger, and typically have more fat. You also have to deal with a flap of meat on the bone side of spare ribs and a strip of meat and cartilage along the edge. You can find spareribs with the extra flap and cartilage removed by the butcher. These trimmed spareribs are often referred to as "St. Louis Style". While the spare ribs turned out okay, my family let me know in no uncertain terms that they prefer the "other kind". So from now on, I'll stick to baby back ribs even if I have to chase all over town to find them. I thought I'd post one final update to the construction of the table for my large Big Green Egg. We finally got the BGE placed in the table and cooked on it for the first time. And it's awesome! In an earlier post, I talked about some of the finishing touches. We did run into one snag. If you notice in the photo, the paver that the BGE is sitting on is not flush as was intended. We discovered that the spring hinges on the dome actually rotate downward slightly when opening the lid and we hadn't allowed enough clearance for this. So we had to make accomodations for that by raising the egg slightly by inserting slats under the paver. All in all, I think it turned out really well. I have to give special thanks to Zino & Davidhoff for all their help. Without them, I would have probably just bought the BGE table or thrown together something that wouldn't have been nearly as nice as this table. 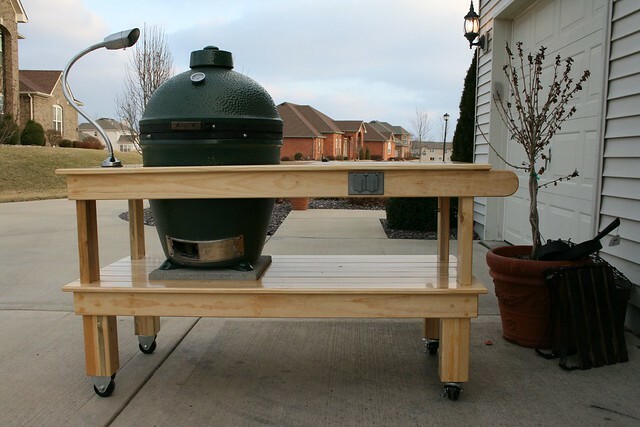 Are you building a table or cart for your Egg or other cooker? Drop us a comment and let us know how it turns out. If you've been following along, you know that the table has taken shape mostly from materials that were already at hand. This includes some of the "finishing touches" that I talked about in a previous post. The finishing touch that I'll talk about today is another of those that sprouted from things we had lying about. If you're like me, you often find yourself cooking overnight. Now I haven't invested in a Stoker or a Guru (yet), so I will typically check the cooker throughout the night. This drives the need for illumination. So we decided that this table should be wired for electricity. This would allow us to mount a hardwired grill light and electrical outlets that will someday accomodate one of the aforementioned fire control devices, an electric knife, etc. I ordered a permanently mountable grill light from the good folks at Amazon. Zino had an all weather recepticle and the necessary wire, conduit, and the like. So here's what we came up with. So as you can see, the table is done with the exception of installing the BGE. We're ready to roll this bad boy outside and start using it. I'll update the project one more time when we get the cooker installed and let you know how it turns out. We're coming down the home stretch on the construction of the table for my Big Green Egg. The framing is complete and now we're finishing the lower & top shelves. The hard part of the top shelf is cutting the giant circle for BGE to sit in. So we installed most of the top decking but only the middle board on the end where the Egg will sit. This was simply for an anchor point to be able to draw the circle. And here we are with the whole cut for the Egg. Now that's a big hole! We also framed a spot to insert a ceramic tile work surface. We're getting close to wrapping up the project. All we have left are the finishing touches. Hopefully I'll be able to provide pics of the finished product in the next post. Construction continues on the table for my Big Green Egg. I've looked at tons of tables built by other users and the ones that I like the most are the ones with what I'll call "finishing touches". So, Davidoff, Zino & I decided that we were going to focus on really finishing this thing off nicely. One of the areas that we decided needed a finishing touch, is the lower shelf where the BGE will sit. Since the bottom of the BGE gets hot when in use (duh! ), it's important to have a non-flammable material between it and the wooden table. Now most folks accomplish this with a landscape paver, ceramic tile, etc. and our plan is no different. However, we decided that the table would look much nicer if we inset the paver into the bottom shelf rather than simply place it on top of the shelf. Let's face it, landscape pavers look great on a patio but they're not much to look at as a piece of furniture. Here's the "finishing touch" that we came up with for this feature. So the BGE will sit on a flush mounted paver. I like this finishing touch. Stay tuned for more udpates on our progress. Construction of a new table for my Large Big Green Egg is underway. As I stated in a previous post, most of the materials for this project come from the things my two compatriots and I had lying around. Davidoff also had a landscaping paver that we will inset on the lower shelf to hold the egg. The 1x4's used in the framing are also scrap pieces that I had lying around. We'll purchase the decking for the shelves and a 1" dowel that we plan to use as a handle on one end. We have a couple of tricks in mind that'll be really cool and set my table apart from the crowd and those may require an additional purchase. Zino has quite an extensive shop in his basement with at least one of every kind of tool we'll need for this project. So that's our work location. Here are a couple of shots of the early construction. I'll update the construction as we go. As I said, stay tuned for a couple of really neat features that we plan to incorporate into the design. If you cook on a Big Green Egg or a similar ceramic cooker, you probably started with the egg nestled snuggly in a "nest". That's simply the stand with casters that holds the egg at a usable height. Many of us also opted for the flip-up tables to provide a work surface near the egg. However, you quickly come to realize that even this is not enough work surface. Personally, I added a side table and still find myself juggling cooking utensils, pans, aluminum foil, BBQ sauce etc. So I began to consider purchasing one of the tables from the Big Green Egg folks. However, after consulting with a buddy of mine we determined that we probably had enough stuff lying around to build one on our own. We set about finding plans for a table, collecting the items that we already had, and determining what additional parts we'd need. We located plans at a couple of places. Big Green Egg has plans available here. We also consulted The Naked Whiz for plans as well as a nice gallery of tables other folks have built. We landed on a modified plan based on everything we read and learned because we needed to take into account that we were starting with lumber, casters and paving stones that we already had lying around. Over the next few days, I'll post our progress and photos. I'm pretty excited about leaving the nest and moving the egg into a more permanent home. Stay tuned! Here in the midwest, we got quit a blast of winter last night. I woke up this morning (actually the school woke me up to tell me there was no school) to ~3 inches of sleet & snow on the ground. So I elected to exercise a little flexibility afforded to me by my employer and work from home. Around lunch time, my neighbor called to say he had a pork loin in the freezer and since we were both home it seemed like a good excuse to cook. So around 3:30pm I fired up the Big Green Egg. I shoveled just enough space outside of the garage to be able to roll the egg outside. In nothing flat, I had a 275 degree fire with an indirect setup. We put the pork loin on and retired to the warmth of our respective homes. By 6:00pm, the pork loin was at 160 degrees internal and I declared it ready to eat. I cut a hunk off for my trouble and left the rest for my buddy. I mean heck, he provided the meat. I had also done some sliced potatoes tossed in olive oil and a little grill seasoning (I call 'em Cheater Fried Potatoes). It's kinda cool to be able to work from home while tending the fire and having a fresh meal off of the cooker in mid-week. Other than grilled chicken or burgers, I don't get to enjoy mid-week cooking very often. How'd you spend your most recent snow day? Drop me a comment and let me know.